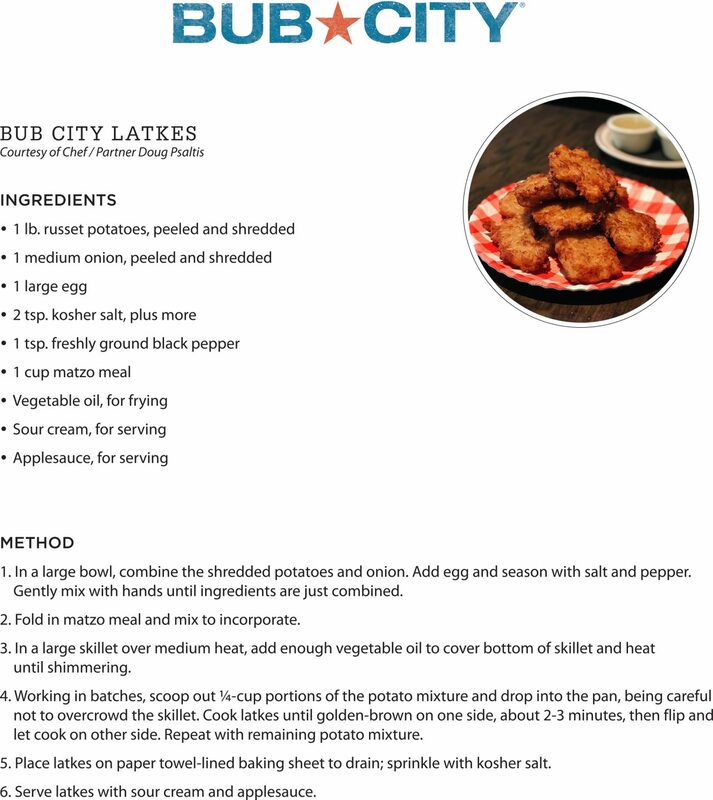 Celebrate Hanukkah by making these home-cook-friendly latkes, adapted from Bub City‘s own recipe. Don’t forget to serve with sour cream and your favorite applesauce! Prefer to leave the cooking to someone else? Enjoy Bub City’s latkes in River North or Rosemont as part of their 18-hour Pastrami Special served every Thursday! In a large bowl, combine the shredded potatoes and onion. Add egg and season with salt and pepper. Gently mix with hands until ingredients are just combined. Fold in matzo and mix to incorporate. In a large skillet over medium heat, add enough vegetable oil to cover bottom of skillet and heat until simmering. Working in batches, scoop out ¼- cup portions of the potato mixture and drop into the pan, being careful not to overcrowd the skillet. Cook latkes until golden-brown on one side, about 2-3 minutes, then flip and let cook on other side. Repeat with remaining potato mixture. Plate latkes on paper towel-lined baking sheet to drain; sprinkle with kosher salt. Serve latkes with sour cream an applesauce. To download the full recipe, click here.